Who’s sweet as honey and buzzing around with fun, adventure, and determination? 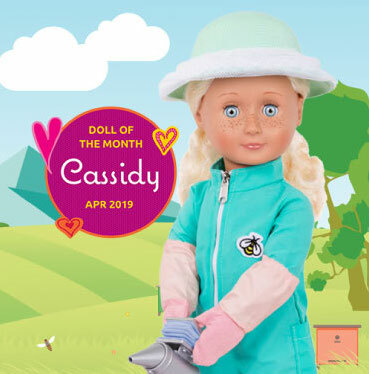 It’s April’s Doll of the Month Cassidy, the Beekeeper Doll from Our Generation! Cassidy is excited to tell you all about the joys of being an apiarist*, and about why bees are so important to our world….and so cool, too! Thank you so much for taking the time to chat with us, Cassidy! It’s my pleasure! I love meeting new people and making new friends! So, you’re a beekeeper! What inspired you to choose this as your profession? Well, all my life I have loved honey! It’s so delicious, and you can use it in cooking and for lots of other things, too. For a school science project, I chose bees and honey as my subject. I learned a lot about where honey comes from, and about bees and their societies. Once, my school went on a field trip to an apiary* where we met a beekeeper (also called an apiarist) and got a tour of all the beehives. It was SO COOL! After that, I got more and more interested in bees, and becoming a beekeeper just seemed like the right fit! What are some of the most interesting things you have learned about bees? Wow, there is so much to know about bees that it’s hard to choose what I find the most interesting! I could probably talk about bees all day long! First of all, not all bees are alike. There are honey bees who live in beehives and produce honey and beeswax, but there are also many species* of wild bees – around 20,000 species all over the world! Every species of bee is unique, and they live on every continent* except for Antarctica. Second, I think it’s really interesting how bees communicate! For example, when a honey bee finds a great patch of flowers, it will return to its beehive and perform a little dance known as a “waggle” (isn’t that a cute word?) The way the bee waggles* can tell its friends the exact directions to the flower patch – even if it’s miles away! So cool! The third thing that I find really interesting about bees is that humans have been keeping beehives and helping to take care of bee colonies for a really long time, like thousands of years! The first beehives were from Ancient Egypt and Greece, some of the world’s oldest societies. But what I find cool is that even though people have been caring for bees for thousands of years, the tools we use as beekeepers haven’t changed very much. You really know a lot about bees! Can you tell us about the tools you use as a beekeeper? Sure! The very first thing you need is a protective suit. Bees are very curious, and also very protective of their beehive. Most of the time bees will not sting you, but sometimes if you startle them or if they think their beehive is in danger, they might get nervous and attack. So a protective outfit is very important. I usually wear a jumpsuit over top of my regular clothes. It’s all one piece without any small holes where bees might be tempted to sneak in and say hello. I also wear long gloves to protect my hands, and a wide-brimmed hat with a net over it. This lets me see what I’m doing, but it’s all tucked in so none of my curious bee friends can sneak in for a visit without me knowing about it. A good, solid, and cozy beehive is also very important. To make sure your bees are healthy and happy, they need a safe and clean home to live in where they will want to build their honeycombs* and start making honey. 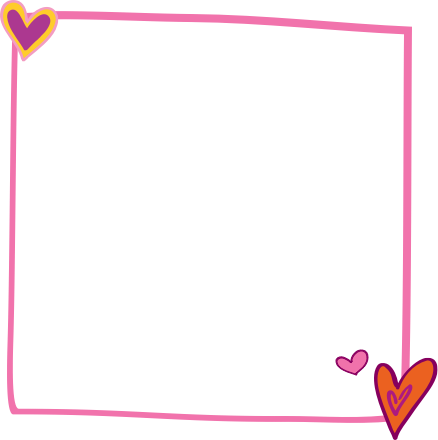 I use a really cute pink beehive, but they can be any color. The main thing is to make sure that they are clean and dry, and that water won’t get in when it rains. It’s also nice to be able to lift the lid so you can take out the honeycombs and start harvesting* your honey! Another important tool that I use is the beehive smoker. The smoker is almost like a small metal watering can attached to an accordion shape (the bellows*). Inside the beehive smoker I put a little bit of wood and set it on fire. The bellows draw some air into the smoker, and then help puff out the smoke into the beehive. We are very curious about the beehive smoker. Why do you need one, and what does it do? Well, as I said, bees are very curious and protective of their beehives. Bees can’t talk the same way people do, but they communicate with each other through their movements and through smells. Even if you and your bees are good friends, you might scare them when you come to check out their hive. If a bee gets nervous or scared, it produces a certain kind of smell called an alarm pheromone* that tells other bees nearby that there is a problem. And because bees are social, once one bee becomes afraid and sends out an alarm, the rest of them will follow and send out their own alarms in a chain reaction. Uh oh! The last think you want is a whole bunch of scared bees! The beehive smoker lets a very small amount of woodsmoke into the beehive, which helps to calm the bees down and also stops them from spreading the alarm. It also makes them decide to return to the beehive and start eating honey, and just like us, bees are a little less active when they have a full tummy! Wow, that’s so fascinating! Can you tell us a little about why bees need our help? I’m sad to say, but there have been a lot of environmental* issues lately that are causing bee populations* to become smaller and smaller. Some kinds of pesticides and other chemicals that humans use are very poisonous to bees, and the more we use these chemicals, the more trouble the bees are in. Also, there are less wild places where bees can live in their hives, so they are running out of space and are getting farther away from the plants they need to survive. This is a big deal for us people, because bee pollination* is responsible for one out of every three bites of food we eat!! That’s a lot! Also, even the bees that don’t make honey, like the many kinds of wild bees, are really important for pollination. So taking good care of bees is pretty important! What are some of the things we can do to help save the bees? I’m so glad you asked!! There are lots of little things you can do to provide a safe and healthy spot for bees, right in your own backyard! For some great ideas, check out our guide to helping bees from the Our Generation Glowing Hearts Blog! In a nutshell – plant bee-friendly flowers (with no chemicals on or in them) and you can even make a bee hotel – a small structure that you put in your garden, so bees will have a home away from hive! You can also do some easy research on the internet and find out lots more ways to make a difference! That’s great advice! When you’re not busy beekeeping, what are some of your other hobbies? Well, one thing that my bees and I have in common is that we all love flowers! When I’m not caring for my beehives and collecting honey, I do a lot of gardening. It’s peaceful to be outside in the sunshine watching my flowers bloom. I also really like kayaking! I go any time I have a chance, and there are a lot of really fun rivers and lakes near me that I enjoy exploring. You can see a lot of animals from the water, like ducks and even sometimes deer on the shore! Thanks Cassidy, you’ve given us so much great information! We’re so happy to have had the chance to talk to our April Doll of the Month!